Own Breaking Bad - Better Call Saul Mug from Deff, DVD, Blu-Ray & 4K Video Specialists - Free UK Delivery..
Emmy Award winner Bryan Cranston (2008 Outstanding Lead Actor in a Drama Series) stars as Walter White a down-on-his-luck chemistry teacher struggling to make ends meet for his wife (Anna Gunn) and physically challenged son (RJ Mitte). Everything changes when Walter receives a startling diagnosis: terminal lung cancer. With only a few years to live and nothing to lose Walter uses his training as a chemist to cook and sell crystal meth w..
Walt (two-time Emmy award winner Bryan Cranston) and Jesse (Aaron Paul) are in way over their heads in Breaking Bad: The Complete Second Season. As their partnership reaches new heights, Walt and Jesse begin to see the extremes of the drug trafficking business. Their trademark blue meth is making them rich, but it's getting more difficult than ever for Walt to conceal the truth from his wife Skyler (Anna Gunn), his son Walter Jr. (RJ Mi.. Winner of two 2010 Emmy Awards, including Outstanding Lead Actor in a Drama Series for Bryan Cranston and Outstanding Supporting Actor in a Drama Series for Aaron Paul, Breaking Bad: The Complete Third Season returns, hailed by the Los Angeles Times as "the best show on television." Even though his cancer's in remission, chemistry teacher-turned-meth maker Walter White (Cranston) still can't catch a break. His wife (Anna Gunn) has filed.. 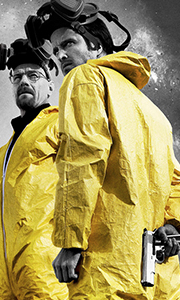 The phenomenon continues as "Breaking Bad" hits a stunning new high with its most suspenseful season yet! In his multiple Emmy Award-winning role, Bryan Cranston stars as Walter White, a one-time mild-mannered chemistry teacher whose transformation into a deadly criminal kicks into overdrive in the explosive fourth season. As his young accomplice, Jesse (Aaron Paul in his Emmy Award-winning role), turns increasingly distant and hostile,.. Uneasy lies the head that wears the crown. Bryan Cranston and Aaron Paul return in their Emmy winning roles of Walter White and Jesse Pinkman in the fifth explosive season of Breaking Bad. With Gus Fring dead, Walt's transformation from a well-meaning family man to ruthless drug kingpin is nearly complete. Forming a partnership with Jesse and Mike (Jonathan Banks), Walt proceeds to make a killing in the meth business until the fruits of.. Uneasy lies the head that wears the crown. Bryan Cranston and Aaron Paul return in their Emmy-winning roles of Walter White and Jesse Pinkman in the fifth explosive season of Breaking Bad. With Gus Fring dead, Walt's transformation from a well-meaning family man to ruthless drug kingpin is nearly complete. Forming a partnership with Jesse and Mike (Jonathan Banks), Walt proceeds to make a killing in the meth business until the fruits of.. It all ends with a bang! In the final episodes, Emmy winners Bryan Cranston and Aaron Paul bring the saga of Breaking Bad to a bloody conclusion in their roles as meth kingpin Walter White and his guilt-ridden partner Jesse Pinkman. As each tries to get clear of the wreckage they left behind in the meth world, DEA agent Hank Schrader's obsessive pursuit of 'Heisenberg' gains steam, leading up to a shattering finale that will leave no on..
Bryan Cranston gives an Emmy Award-winning performance as Walter White a down-on-his-luck chemistry teacher struggling to make ends meet for his wife (Anna Gunn) and physically challenged son (RJ Mitte). Everything changes when Walter receives a startling diagnosis: terminal lung cancer. With only a few years to live and nothing to lose Walter uses his training as a chemist to cook and sell crystal meth with one of his former students ..
Own Breaking Bad Seasons 1 to 4 DVD from Deff, DVD, Blu-Ray & 4K Video Specialists - Free UK Delivery.. The incredible saga of high-school-chemistry-teacher-turned-meth-kingpin Walter White is here in its entirety: all 62 uncut, uncensored episodes! Emmy winner Bryan Cranston portrays Walter White, a family man who turns to crime after a lung cancer diagnosis unravels his simple life. Recruiting former student and small-time dealer Jesse Pinkman (Emmy winner Aaron Paul) to be his partner in crime, Walt rises to the top of the meth trade, ..
Own Breaking Bad Seasons 1 to 6 Complete Collection DVD from Deff, DVD, Blu-Ray & 4K Video Specialists - Free UK Delivery..
Own Breaking Bad Seasons 4 to 6 - Final Seasons Box Set DVD from Deff, DVD, Blu-Ray & 4K Video Specialists - Free UK Delivery..
Own Breaking Bad - Better Call Saul - I Can Make It Legal Mug from Deff, DVD, Blu-Ray & 4K Video Specialists - Free UK Delivery..
Own Breaking Bad - Complete Series Tin DVD from Deff, DVD, Blu-Ray & 4K Video Specialists - Free UK Delivery..
Own Breaking Bad - Heisenberg Dollar Mug from Deff, DVD, Blu-Ray & 4K Video Specialists - Free UK Delivery..
Own Breaking Bad - Heisenberg Mug from Deff, DVD, Blu-Ray & 4K Video Specialists - Free UK Delivery..
Own Breaking Bad - Heisenberg Wanted Mug from Deff, DVD, Blu-Ray & 4K Video Specialists - Free UK Delivery..
Own Breaking Bad - Los Pollos Hermanos Mug from Deff, DVD, Blu-Ray & 4K Video Specialists - Free UK Delivery..
Own Breaking Bad - Methylamine Mug from Deff, DVD, Blu-Ray & 4K Video Specialists - Free UK Delivery..